Warts are basically caused by a virus called as Human Papilloma Virus (HPV). There are around 100 types of these viruses varying from mild to severe ones. Since warts are caused by a virus there is every possibility that they can spread to the other body parts or to other people altogether. Moles are formed as a result of the accumulation of melanocytes. Melanocytes are cells that cause pigmentation. The occurrence of moles depends on hormonal discontinuities, exposure to the sun or by genetic inheritance. They might be rough, smooth, elevated, with or without hair. But, on the whole, they cause the reduction of the face value. They mostly disappear with age, but sometimes they do not. Beneath our facial skin layer, there are sebaceous glands which produce an oil-like substance called as sebum. The skin pores of our face usually excrete this oil along with the dead skin cells. But due to the usage of excessive makeup or due to pollutes surroundings, these pores can get closed and the sebum cannot be excreted out. This leads to the formation of pimples, acne, etc. These follow warts. These are not harmful but are irritating and unforgiving. They are flesh bumps which get formed over the skin. These are majorly caused at the places of skin folds. Their size generally ranges from a grain to that of a pea. Skin Tags can cause an ugly appearance and are extremely embarrassing as well. Dark Spots can be a consequence of various conditions. These conditions might include insect bites, severe sun exposure, skin allergies like chicken pox, aging or genetics. Whatever might be the reason, nobody would feel opportune to have them. Like told already, warts can be essentially very annoying and disgraceful. A weak immune system can easily cause them. However with the following natural remedies you can make sure that you are losing warts. Warts can be stubborn and these are all not overnight healing procedures. Warts are mainly caused by viruses and the strong anti-inflammatory properties of apple cider vinegar can effectively bring about a great wart-removal mechanism. Thoroughly wash the affected wart region of your skin with mildly warm water. Now, dip the cotton ball in the apple cider vinegar and apply it onto the affected areas of your skin. Cover that with the band-aid or duct tape for at least one complete day. You can do this before going to bed and discard it the next day morning. Repeat this for a few weeks. This is yet another proved natural remedy to treat warts. This cure has also been tremendously published by various magazines and journals and many have also got over the problem of warts with this. Take the banana peel and rub the inside portion of it over your warts. Repeat this for a few times in an entire day. Do this for about 1 month. Press the inside of the banana peel over your wart region. Now, cover it up in place with the tape. The next morning, remove the tape and wash it. Keep repeating this until you feel that the wart on your skin has softened. This might take from a single week to a month. Place the piece of duct tape over your wart. Cover it with the duct tape. Make sure that the wart is covered with the duct tape continuously for 6 days. Replace the tape when and wherever necessary. After the completion of 6 days, soak the wart in water and rub it with the pumice rock or the emery board. The next morning, use another fresh duct tape and keep repeating this process for about 2 months till the wart gets vanished off. The purest form of honey as of now is the Organic Manuka Honey which is harvested in New Zealand. This is the best form of honey since it inclines itself to the fluctuating temperatures and still keeps its beneficial properties intact. Using this honey to treat warts is very much effective. It uses the same therapy as the duct tape one i.e., by cutting down the supply of oxygen to the skin wart. Cover your wart with a dense coat of the raw honey. Now conceal it with the bandage. Keep repeating this for a relentless period of 24 hours by replacing the bandage and adding the required quantity of honey. Do this daily until you witness the disappearance of the wart. Garlic is possibly one the best and the most useful things in your kitchen to treat your skin warts. Crush the garlic cloves and extract their juice out. Apply this juice on your wart-affected region. Repeat doing this for two times in a day until the wart starts to disappear. Moles sometimes can be harmful. But in most cases they aren’t. If you find that your moles aren’t disappearing even after several trials of losing them, then you are possibly facing a cancerous mole issue. Apart from that too, moles can seemingly make you look disgusting and awful. 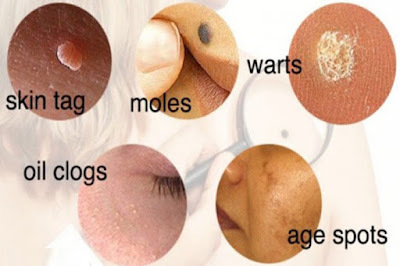 So here are a few nice natural remedies which would help you in getting rid of moles. Unneeded growth of oil can be prevented by castor oil since it can dissolve it up. The best part is that using castor oil will not even leave scars. The only thing that you got to adjust with is it is time-consuming. Mix both of the ingredients together and make a fine paste. You might as well use only castor oil if you do not have baking soda. Apply this paste over your moles. Leave it for about 2-3 hours till it dries away on its own. Repeat this twice daily for about one month. The acid present in apple cider vinegar has got great qualities to incredibly treat your moles and eventually will make you get rid of them. Dip the cotton ball in the apple cider vinegar and apply it onto your moles. Repeat this for 10 days or until you find complete respite from your mole. Garlic is said to comprise of some very good enzymes which can ably break down the collected mounds of pigmentation causing cells of the skin. Thus in this way they can make you get rid of moles. Crush the garlic cloves and get their juice out. Apply this juice on your moles and cover that area with a bandage. Leave it for a few hours to dry up. Continue to do this for 10 days. This would effectively help you in falling out of the trouble of ugly moles on skin. Like specified already, clogged pores give rise to many other skin troubles like acne, blackheads, pimples and many more. The skin needs refreshing and nourishing which can be done by air circulation. And air circulation can be possible when there are freely working skin pores. Firstly, cleaning your face to cleanse the dirt off it is very prominent. Now, place the bowl of the hot water on an even surface like a table. Place this table at a convenient height in front of you. Now bed over the hot water bowl and cover yourself with the towel. Ensure that no steam is escaping by covering perfectly with the towel. Add the tea tree oil to the hot water and steam your face in this way. Do continue this for about 5-8 minutes by relaxing yourself whenever you feel that you are overheating your face. When you are done with the steaming, pat your face dry with a towel and rest for about a few seconds. Now, apply the coconut oil onto your face to moisturize it. You can avert away from this remedy if you feel that it is causing your skin to get dried up. Repeat doing this once or twice in a single week to reopen your clogged pores. Exfoliation is yet another wonderful method to deal with your jammed skin pores. You tend to find ample number of scrubs in beauty and medical stores. But they contain chemicals. So using a homemade scrub is the finest of the ways to deal with this issue. And sugar is the best ingredient in this regard. Get the sugar well ground to make a fine and a smooth powder. Add the lemon juice to this powdered sugar. Next, add the water and make a granulated paste out of these. Now, apply this mixture over the affected regions of your clogged pores. Make circular movements with your fingers to enhance the process. Eventually, wash your face with the cool water and pat dry. Hydrate your skin well with coconut oil. Repeat this for about 2 times in a single week. Like told previously, skin tags are formed from the friction caused by folds of the skin at certain places. Use the below remedy to cure skin tags. Dip the cotton ball into the ACV and apply it onto your skin tags. Let it get dried up naturally. Repeat this for a few times in a day to get remarkable results. Dark spots are another irritatingly annoying skin trouble which is natural in reducing the prettiness of your face. So lemon is the best answer to dark spots or age spots. Apply the lemon juice with the cotton ball over your dark spots. Repeat this about 2 times in a whole day. Keep continuing this for about 1 month to find mind blowing results. Aloe Vera as well works wonders in ably treating dark spots or age spots. Carefully apply the Aloe Vera gel over your brownish or dark spots. Let it stay on for about 30 minutes. Clean off with cold water. Repeat doing this twice a day to witness results against dark spots. When you are paying attention to the slightest changes that occur with your skin, you can easily avoid them. Prevention is the best cure and, therefore, changing certain habits of yours to make the conditions conducive for a healthy skin is very important. But still, if you are not able to control the sensitivity of your skin, the above remedies will greatly help you out.